Spurred into action by the Kavanaugh hearings, #BlackFridays has inspired weekly symbolic walkouts across the country and brought together a vast network of women. In practice, this meant groups across the country took weekly actions each Friday, starting on October 5, in which they would “walk out” in a variety of ways. Whether walking out of school or work, or walking out to the polls to vote, these actions were tied together by a weekly theme across the country. On November 2, people “walked out” to a woman-owned local business. In the week before the election, people “walked out” to prepare for Election Day by voting early, making a video to share on social networks, and bringing information to other community members to make sure they were prepared to vote. The last week of #BlackFridays actions are geared toward supporting the #WeKeepUsSafe campaign with Million Hoodies for Justice. All of these actions have emphasized the importance of listening to impacted communities, people of color and local organizers — not only to raise the visibility of certain issues, but to create connection and community between the people taking part in the actions. Long-term organizer and author L.A. Kauffman, a signatory to the #BlackFridays launch letter, described these actions as a “hybrid” between a strike and a more traditional get-out-the-vote effort. This has led to a unique emphasis on both noncompliance with existing systems of oppression and electoral mobilization geared toward changing the system from within. 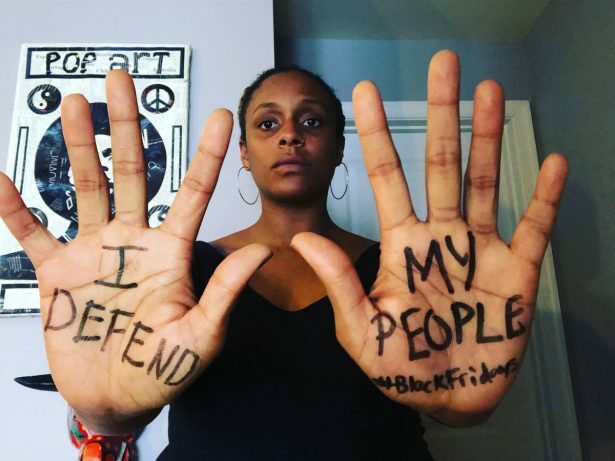 According to organizer Angela Peoples, the concept for #BlackFridays emerged from the collective trauma and rage many women of color felt as the Kavanaugh confirmation process unfolded. This emphasizes perhaps the most important aspect of the #BlackFridays actions: They have helped a vast network of women — particularly women of color, trans women and immigrants who have experienced state-sanctioned violence — forge stronger bonds and connections. “We had folks from all cross-sections of our community and our country taking action, walking out of their jobs and homes, and walking into connection with each other,” Peoples said. After the #BlackFridays actions end this week, organizers will be encouraging people to connect with local movements in their communities, lift up local activists and take direction from people of color leading those initiatives.